A young Dothraki warrior, Rakharo is assigned as one of Daenerys Targaryen’s kas, her personal guard. He has drooping black mustachios, and is particularly skilled with the Dothraki curving blade called the arakh. The actor cast in the role, Elyes Gabel, is older than the character as described. 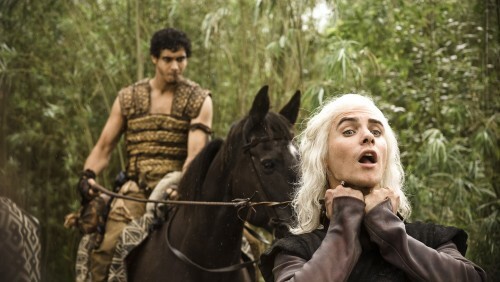 He as originally cast in the role of another Dothraki ko, Jhogo, who was even younger than Rakharo and favored the whip. but it was felt in the course of the production that his name was too similar to Drogo’s and so his name was switched to Rakharo. Whether he’ll shown to particularly favor to the whip as a remnant of his original role remains a question.